Maurizio Sarri may not have swung the fans in favor of him personally but has directed Chelsea back towards Champions League football. Two successive victories in the Premier League has thrown Chelsea straight back into the European conversation, despite just a matter of weeks ago, all seemed lost. This has not however swayed Sarri's critics, especially after the 'We want Sarri out' chants came crashing down in the win over Cardiff City. The Italian did regain credibility in starting Callum Hudson-Odoi and Ruben Loftus-Cheek in the previous match, players who the Blues faithful have been desperate for to appear on the field. West Ham act as the next opposition, with worries of their own. Manuel Pellegrini, like Sarri, took over in the summer but is yet to build a Hammers side with much substance. They make the short trip to Stamford Bridge 11th in the table and lacking formidable form; Chelsea must capture the opportunity to close the gap on the top four. As mentioned, Chelsea have two wins on the spin and could make it three in the league for the first time since September. In fact, they have only lost once in their last eight fixtures in all competitions, albeit another damming defeat, 2-0 to Everton in March. Their record at the Bridge is surprisingly one of the strongest in the land, having lost only one home tie in the top tier this campaign, conceding the fewest amount of goals in the meantime. Sarri's squad come into their meeting with West Ham, off the back a Brighton & Hove Albion battering, collecting three points and three goals, ending the evening 3-0. The Hammers have been constantly inconstant; their recent record reads WLWLWL. Currently an extremely curious club, Pelligrini has masterminded positive results against Manchester United and Arsenal, whilst falling short against struggling Bournemouth and more recently, Cardiff. Their latest short comings also came against the Toffees in similar fashion, losing 2-0 at the London Stadium in a home performance of the poorest standard. This clash in the capital can be dated back as far as 1923 when the pair languished in League Division One. Fast forward in time and the match made in London has been a regularity in the top division, a 13 year stretch separated when West Ham were relegated to the Championship in 2010/11. Between 2004 and 2011, the Blues boasted an unbeaten record against West Ham, winning 11 and drawing twice. Now with only three victories in the past eight, the Hammers have built up a resistance to their city neighbours. 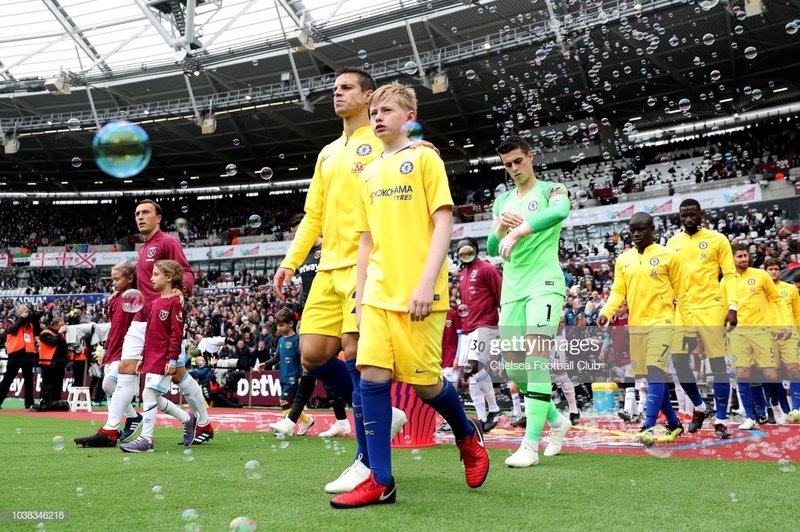 Goals are usually a given between Chelsea and West Ham, however the last encounter witnessed a 0-0 draw at the ground of the Hammers, only the second stalemate since 2000. This ended Sarri's five game victory streak at the start of his reign in England; how the landscape of management can alter so quickly. Loftus-Cheek will be cursing his luck, having not trained on Friday due to a niggling back problem, unable to build from his goal against Brighton. Marcos Alonso was absent from the match through a hamstring injury and will have to contend with fellow left-back Emerson, the Brazilian impressing on his rare outings. Pedro may play a part having sat out at the Bridge on Wednesday, yet Hudson-Odoi deserves to start his second league game running. Predicted line-up: Arrizabalaga; Azpilicueta, Luiz, Rudiger, Emerson; Barkley, Jorginho, Kante; Hudson-Odoi, Higuain, Hazard. Pellegrini has been boosted by the return of three players before the derby. Felipe Anderson, Samir Nasri and Ryan Fredericks returned to training, thus entering the conversation to feature on Monday night. Anderson's re-arrival in particular will please Pellegrini; he is the Hammers top scorer (eight) and sits second for assists (four) in the league. West Ham will still be without Andy Carroll, Carlos Sanchez, Andriy Yarmolenko, Jack Wilshere and Winston Reid, following their continued trips to the treatment table. Predicted line-up: Fabianski; Zabaleta, Ogbonna, Balbuena, Creswell; Snodgrass, Noble, Rice, Anderson; Arnautovic, Hernandez.